Sometimes truth sneaks into movies, even mega-blockbusters. For all its mass appeal, simplistic plot line and questionable cultural appropriations, the movie Avatar depicts some really important truths and provokes really important questions, which are worth contemplating this lunar month. James Cameron, the director of Avatar, is very good at tuning into the gestalt. In his last move, Titanic, he did the same thing. I don’t know Cameron’s exact birth time* but he most likely has a Pisces Moon (though it could also be in Aries). Pisces people perceive connections. They are usually good at tuning into wavelengths outside the norm. I am also intrigued by Cameron’s connection to Jupiter. Titanic was released 12 years ago - the span of one Jupiter cycle. When Titanic was released Jupiter was transiting the last few degrees of Aquarius, just where Jupiter is right now. Avatar especially captures both Piscean and Aquarian themes. Both of these signs are currently coloring the world in important ways and begs me to look at what the movie shows about where we are now and what to pay attention to as the year progresses. The planetary players important to our story. Jupiter has spent the last year in Aquarius. It enters Pisces right after the New Moon on January 15. Jupiter is the planet of big energy. It infuses us with optimism, a sense of truth or meaning; it asks us to move beyond previous limitations. Cynthea Jones calls Jupiter the Bringer of Fair Winds. It makes things bigger. This past year, Aquarian themes of community connection, technological fascinations, and social networking on the Internet relate to Jupiter’s transit. But Jupiter was not alone; it traveled with Neptune and Chiron in a long period of triple conjunction. Neptune and Jupiter both hold claim to Piscean energy. Both are co-rulers of that sign. All this Aquarian revolution was also about the ways we are all connected. 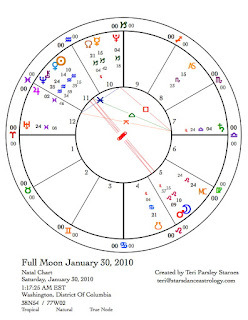 For me, Obama’s inauguration was a Jupiter/Neptune in Aquarius experience. The presence of Chiron contributes a deeper tone reminding us of wounds and how we long for wholeness. In addition to the triple conjunction, Uranus in Pisces has been in mutual reception** to Neptune in Aquarius since 2003. It is like Uranus and Neptune have been exchanging genetic material all this time and are giving birth to a new paradigm. Uranus is coming to the end of its transit through Pisces. Its entrance into Aries this May will be very significant, representing a crossroads for us as a world. More about this in a moment. The connections are real. Avatar depicts an alien world where all things are connected. Where the beings, who most resemble humans, live in awareness of and respect for that connection. In simple terms, a world where all is sacred and because these connections are honored and have not been severed, there is creative and helpful relationship between every aspect of this world – the animals, the plants, the people, the ancestors, and most likely, even the elementals. (Let’s imagine why the mountains float.) Even though the world is alien, this is the most accurate thing about this movie. Everything IS connected. And relationships such as the Na’vi have with everything on Pandora happen also in our world, in our time. And yet, many do not believe this. For many of us, the connection has been severed. Others of us who do maintain connection may not feel the full force of what a deeper awareness of this connection could create. Avatar helps us to re-imagine what we are missing. Perhaps we are poised on the brink of remembering, not just a few of us, but most of us. What would that be like? The planets are conspiring to re-enchant us and to challenge us in this next stage of growth. While Jupiter is in Pisces, we will have the opportunity to feel with Pisces sensitivity how we are connected. However, Jupiter moves through all 30° of Pisces in a very accelerated pace and enters Aries in just June of 2010. For several years now, due to retrograde happening at just the right degree, Jupiter has stayed completely in one sign for about a year. This year, Jupiter moves quickly through Pisces, enters Aries in June, travels up to 3° Aries, turns retrograde on July 23, and then goes back into Pisces in September until January 2011. We will shift quickly from sensitive Pisces to action-oriented Aries this year and then back into Pisces. Jupiter is not the only planet doing this shift, Uranus also enters Aries this spring and shifts back and forth from Aries to Pisces. This motion between Pisces and Aries is important. Where the plot falls short. With this kind of connection with a living world, why does this story resort to violence to save this world? Why are the Na’avi relegated to the role of victim and why does it take a white male Earthling “to save the day?” So, Hollywood isn’t perfect. Neither are we as a species. We still have a hard time imagining other solutions to injustice than violence. The shift of Jupiter and Uranus between Pisces and Aries will test us to think of new responses. All the signs are necessary, yet every sign has a shadow. The Aries shadow is a quick fuse that can resort to fighting and attacking. Our fuses will be extremely short when Uranus enters Aries. Pent up frustrations, especially concerning injustice (Saturn in Libra theme) will provoke action. That IS what Aries is good act – action. The positive warrior aspect can be invoked. Pisces represents the end of a cycle. Think of it as the dreamtime right before we wake up. Aries is that impulse to jump right out of bed without giving our dreams a second thought. But we need our dreams. They remind us of our connection. The world of Pandora is a big ole Pisces dream. I believe there are messages in that dream to help us re-imagine our responses to injustice. Every time the humans in the story shifted into their avatar forms and back into their human forms, they were mirroring the link between Pisces and Aries. This Lunar cycle. 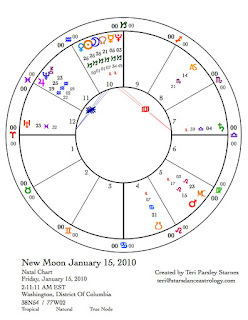 The New Moon of January 15 is a Solar Eclipse. Tragically, the earthquake in Haiti is in our hearts at this time. Eclipses heighten experience; we are asked to make more room in our hearts. This is a collective experience colored by Pluto square Saturn. These two planets apply the pressure. We feel that we may not be able to take much more. Capricorn, where the eclipse takes place, is a guide to how we should respond. This tells us to pay attention to infrastructure, underlying injustices, and better stewardship of resources. Capricorn is very pragmatic. How are you being responsible to any pressure in your life right now? Mercury is stationing direct as well. Think over this Mercury retrograde cycle that began on December 26. What have you learned? The Full Moon on January 30 shows the exact square between Pluto and Saturn. By this time I expect that the pressure will be released for a while. This doesn’t mean that we can stop thinking about our responsibilities. In fact, we may be able to work for justice and sustainability in a more focused and joyful way. These two planets will square again once more this year. The Moon in Leo is conjunct retrograde Mars. If this Mars journey is about gathering our light, our passions, and our gifts, then the Moon may illuminate this goal. The world needs our light. By the Full Moon, Jupiter is in Pisces, we are called to remember our connections and our dreams. They are important. ** mutual reception- two planets in each other’s ruling sign.